It seems that ever since Thanksgiving, I’ve unwittingly put myself on a soup and smoothie diet. Don’t get me wrong, I didn’t eat all that bad at Thanksgiving thanks to my Sausage + Cauliflower Rice Stuffing, it’s the days surrounding it that are filled with snacks and goodies and not so much of the kale, cauliflower chia seed goodness that my body needs. For example, I notice that when I’m with friends and family I eat things that I don’t usually eat because we don’t keep them in the house. Like chips, dips, cheeses etc. And even though they’re gluten free or organic or whatever “healthier” version of the norm, I still don’t feel great after eating any of it and begin to crave going back to a stricter version of paleo. That brings me to this week when I just want to slurp down some fresh goodness and go easy on my stomach. 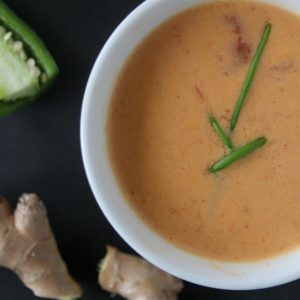 I made this recipe for the first time a couple of weeks ago and it was perfect for my post-Thanksgiving detox. Needless to say it also matches the rainy weather we’re having right now in the Bay Area. I’ve figured out the secret to any delicious soup lies in the roasting of the veggies and a good blender. That’s all you need. Roasting the veggies before hand just brings out so much more of the vegetable’s flavor. Be it carrots, onions… CAULIFLOWER. That bit of carmel-y char you can get from roasting goes a long way. As far as blending you can use any food processor or blender you have on hand but I’ve since become a blender snob and I’m obsessed with the consistency that I get using my Blendtec. And I must say, between smoothies and soups all week that guy has been busting his blades for me! And because I’m all about getting as much flavors into a dish as possible I love adding fun bits like capers and herbs to my roasted veggies or soups. And because we all love bacon, I added us some bacon. The first time I made this dish, I actually made it without the bacon and it was delicious. Eventually I realized that adding some smoky bacon would just take it up to the next level and it did. So the moral of all of that is… feel free to omit the bacon if necessary. Maybe you don’t have it on hand, maybe you’re doing a Whole30 and can’t find compliant bacon or maybe you’re vegan or vegetarian! 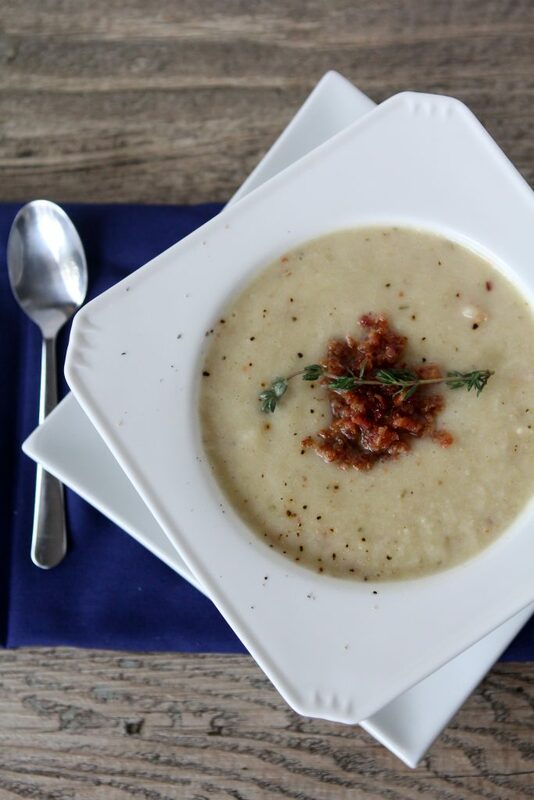 The short of it all is that you will still have an amazingly delicious and hearty soup even with out the bacon. You’re a winner either way! 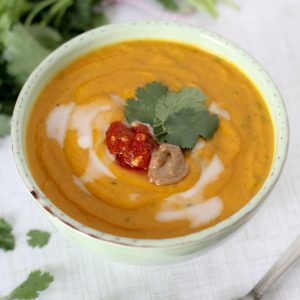 If you’re looking for another vegetable based soup that will knock your socks off, make sure to try my Thai Carrot Soup. 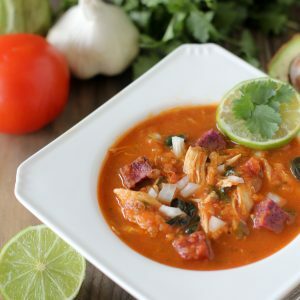 It’s one of my most Pinned recipes and I’m sure you’ll love it just as much. 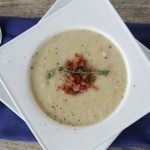 A dairy free roasted cauliflower soup. Bake for 35 minutes until cauliflower is tender and slighting golden, get some goodness on it!